This photo doesn't really do it justice. I'm going to have to invest in a camera with a decent flash. 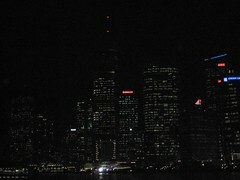 This is the view I get of the Brisbane CBD from the CityCat every night leaving work. A quiet weekend - bliss!